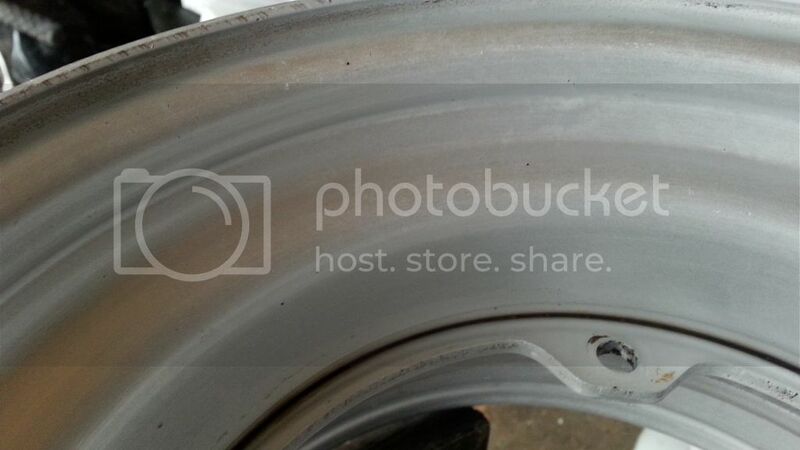 Just a preface, I needed to clean up a very unusually sized wheel (no replacement available) and make it shine. From the factory it was gold anodized and then someone had painted over that flat black. Anodization is the process of oxidizing a very thick layer of the surface of aluminum and then coloring that layer before "closing the pores". Believe it or not, those brilliant colors are ordinary food coloring trapped inside a thick layer of aluminum oxide on the surface of the aluminum. They do this by dipping the part to be anodized into a chemical bath and electrically charging it. The chemicals in the bath oxidize the surface in a uniform manner (much thicker, also than normal weathering on aluminum) and leave the "pores" of the metal surface open. While the part is still hot, they dip the part into a food coloring solution for a predetermined amount of time and then "close the pores" by rinsing in cold water. The best option is chemical stripping. Ace hardware to the rescue!!!! 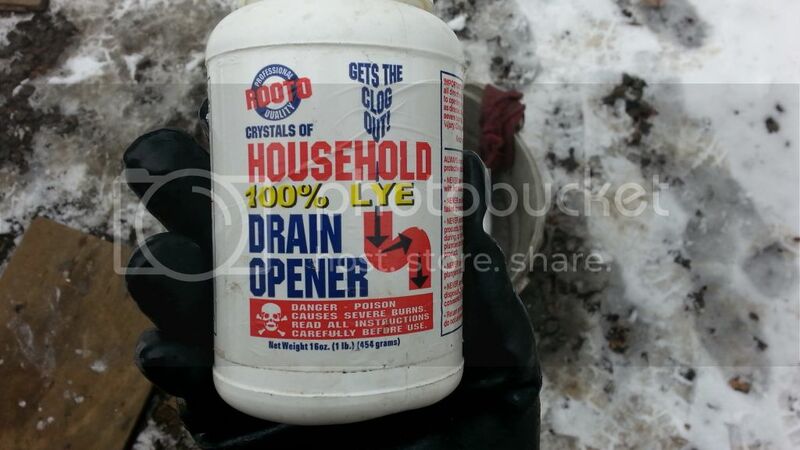 This is a product sold as drain cleaner, it's granulated 100% sodium hydroxide (an EXTREME base also known as lye). It is extremely dangerous. It will permanently blind you if you get it into your eyes, dissolves your skin by turning it into soap, and will hydrolize your lung tissue so DO NOT BREATH THE VAPORS. This is NOT stuff to play around with especially in the concentrations we're going to be "playing" with. Now, I specifically said warm water in the bucket because sodium hydroxide into water is an exothermic reaction. As it dissolves it will heat the water chemically. If you put water in the bucket that's 180°F it will be boiling before you can get the solution concentration we're looking for. Warm water only, not hot, warm! You are looking for a strong basic solution on this, I went with 2 tablespoons per gallon of water. That was overkill and probably too strong, you could go with less. The reaction speed and danger level drops as the content of lye drops but it will take longer to do and considering it was about 20°F outside while I was doing this I threw the pedal to the metal! Put on your large rubber gloves, safety glasses, and respirator now. Pour the granulated lye into the water SLOWLY allowing it to drop in a little at a time. If it falls to the bottom and doesn't dissolve use a plastic (note: no wood or natural fibers, it will just eat them) spoon or something similar to stir slowly. You will see the lye dissolve and the water will get "cloudy" for a minute. Slowly add lye to the water as you stir until it's all dissolved. Lower item to be stripped into the solution (no splashes, this crap eats everything) and stir gently. The reaction works quite well if you let it sit there too and you can watch the bubbles come off of the metal as the reaction takes place but the areas where the bubbles "stick" to the metal will be all cheetah spotted. This isn't any kind of an issue especially at the beginning but the final dip into the liquid you will definitely want to make sure you stir the liquid and wipe the metal to reduce the effort later in getting it shiny. 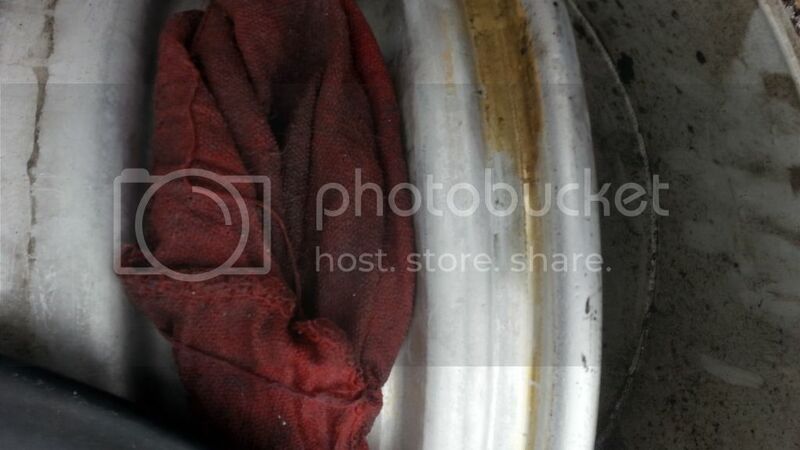 Now, as the reaction takes place, the oxidized layer can actually be wiped off. The rag pictured is a standard "shop" rag and before I was done I had gone through three of them. They begin to unravel as the solution eats them which is not a huge deal if you have a big bag like I do but just be mindful, they don't last forever! You can actually see the gold anodization just wipes away. Here's the catch, the coloring is only in the top 1/3 of the anodization layer. You need to get a handle on how long the solution took to get to the point where the anodization can be EASILY wiped off and leave the part in the solution for about 3 times as long. You can tell when the anodization is all gone because the metal "hazes" like in the next picture but the 3 times as long rule of thumb will get you pretty close to how long it will take for the anodization to be completely removed. On a side note, the anodization only needs to be completely removed if you plan on polishing the aluminum. If you just want to remove the color but don't mind the dull haze of anodization left behind, you can strip until the color is gone and then shut down the reaction. Either way, this isn't the time to go in and grab a brew and watch the game. If the solution is strong enough, this process will produce a steady stream of small chemical reaction bubbles and the stripping process will take minutes, not hours! This is a film layer built up from the reaction (and this is the part that will look cheetah spotted if you never stir the solution) and will be removed later. 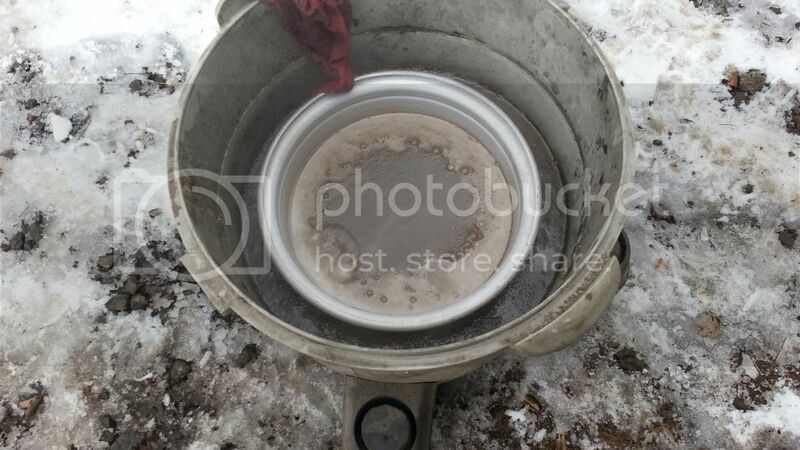 Now for the huge pot of nasty stuff, you will want to neutralize the solution before doing anything with it. You can use any acid (feel free to pour some orange juice in the bucket if you'd like) but I used standard white vinegar because I had some out there. Another (perhaps even better suggestion) is driveway concrete cleaner sold at most hardware stores. It's muriatic acid (also known as hydrocloric acid) However, it's sold so strong that you would need to dilute it heavily before adding to the lye solution meaning another stop. Because the reaction used for stripping used up much of the potency of the solution, it's much less dangerous now than before. Still, be careful pouring any acid into any base as most produce heat while reacting. Mine fizzed and bubbled a little as I poured but soon stopped as the base was neutralized. I then diluted what was left with lots of water and poured it off.